2013 Nissan Patrol gold SUV/Crossover, beige on the inside with ABS and tuner/radio. 20″ wheels. GCC spec 2016 Nissan Patrol, white SUV/Crossover with beige interior. It features airbags (front and side), 18 inch wheels and CD player. Automatic 2016 Nissan Patrol with 20 inch wheels, hill descent control, rear camera, tan interior, white exterior. GCC spec. Automatic Nissan Patrol with 22 inch wheels, air conditioning, power windows, white on the outside, beige interior. 2010 Nissan Patrol with Keyless go, 20″ wheels and 360 Degree camera. Price reduced! 2016 Nissan Patrol white SUV/Crossover, beige on the inside with fog lights and climate control. 20″ wheels. Automatic Nissan Patrol with 20 inch wheels, roof rails, fridge, red interior, grey/silver exterior. Automatic GCC spec Nissan Patrol with 20 inch wheels, power seats with memory, keyless go, tan interior, white exterior. GCC spec 2013 Nissan featuring 4WD, DVD-player, bluetooth system. White with beige interior. Opportunity! A 2013 grey/silver Nissan Patrol Platinum SE with VVEL DIG badge now available at a reduced price. Opportunity! A 2016 grey/silver Nissan Patrol Platinum SE now available at a reduced price. 2016 Nissan with hill descent control, sunroof, power seats. White with beige interior. Automatic Nissan Patrol with 20 inch wheels, 4WD, fog lights, tan interior, white exterior. 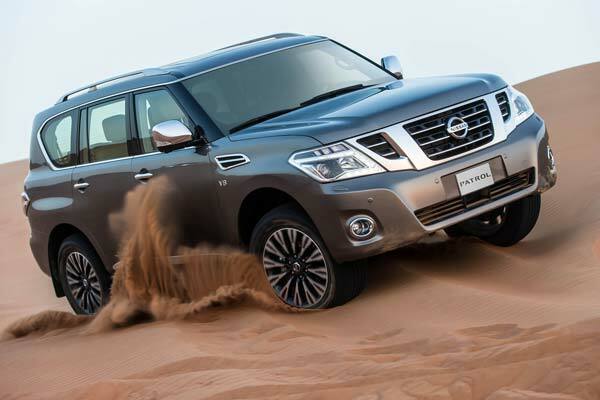 What do our customers say about the Nissan Patrol? Abdul Muhsi - Patrols have been in my family since I can remember and everyone has one at home. Every time someone in my family wants to buy a new or used Nissan Patrol, everyone is involved! It’s fantastic off-road, very reliable and has many great options. I just love my Nissan Patrol. Pros: Spacious, powerful and reliable. Karun - During the week, I work a standard 9 to 5 job. On the weekend, I just can’t stop myself from hitting the desert or a spot of camping, and in my mind there is one vehicle that springs to mind; Nissan Patrol. Not only is it powerful, but we can also fit all the camping and BBQ equipment in the back and still have enough room for five of us! Pros: Powerful A/C, features to keep kids entertained and spacious. 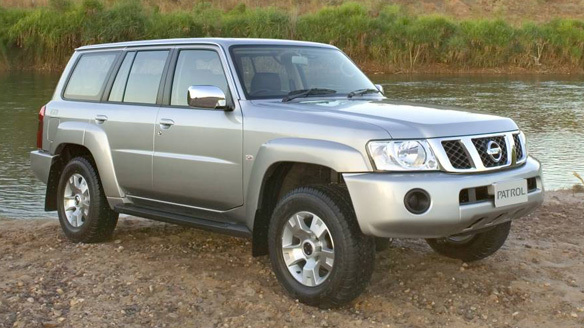 Naseem - I bought my first used Nissan Patrol last year and so far I am very happy with it. Perfect for UAE climate and terrain, and even though it takes up a lot of space on the road, it’s very easy to drive. Interior options are on another level; remote start is my personal favourite as I can start the car from the comfort of my house and make sure it’s cool inside when it’s 50 degrees outside. Pros: Luxurious features for an affordable price, maintenance is easy as it’s so robust and it’s a breeze to drive. Five reasons to buy a new or used Nissan Patrol in Abu Dhabi, UAE! Resale value. Patrols are very popular across the GCC, finding a buyer is extra easy as all the dealers are looking to snap one off. If you are looking to sell your pre-owned Nissan Patrol in Abu Dhabi, you will definitely get a good deal. eight adults can fit inside and fully loaded variants have tonnes of great features including cooled seats and rear TV screens. There’s something for everyone! With a 5.6-litre V8 motor anywhere between 320 and 400 horsepower is generated translating to no lack of power to carve through the desert. Hailing from Japan and we all know that Japanese cars are reliable. 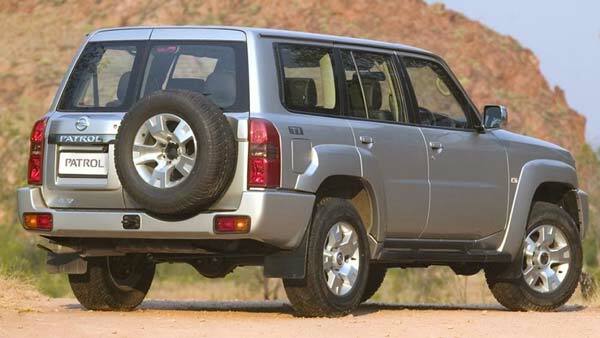 Whether you buying a new or second-hand Nissan Patrol, it will drive and handle like a dream. You know it’s powerful, great offroad and it’s durable but did you know it can tear through the desert while cooling the front seats and passengers in the rear can enjoy a movie if they find the scenery boring. Over 60 years ago, the first Nissan Patrol rolled off the production line in Japan and struck a resemblance similar to that of the iconic Willys Jeep. Although it had a tough time fighting off the Toyota Land Cruiser for its entire life, it’s made quite the impact on not only the roads of the Gulf but the desert too. 1998 models marked the end of the box-shaped four-wheel drive and saw the Japanese SUV morph into a slightly more curvy offroad. Offered in with three doors or five doors with seating for either five people or eight people. Base options included four-wheel drive with diff lock, 16-inch rims, air-conditioning and radio tuner. Optional extras included a CD player, and fridges mounted in the centre console and rear third row. As for engines, three were on offer. An inline 4.5-litre petrol engine was a single engine at first producing 194 horsepower while mated to a 4-speed automatic or 5-speed manual. In 2002, a 4.8-litre six-cylinder motor was added. Rated at 245 horsepower, either a 5-speed auto or manual transmission would power all four wheels. The third option is a 4.2-litre six cylinder diesel powered motor rated at 122 horsepower; this only came with a 5-speed manual. Not many used cars of this era are as reliable as Nissan Patrol, and you can find pre-owned Nissan Patrol in Abu Dhabi older than 10 years in perfect condition. 2005 saw an updated shape to the exterior, now with a CD player and front airbag as standard. Non-standard features included 17-inch rims and central cool box. With upgraded equipment and interior upholstery, it morphed into the off-road SUV to beat. All three engines were retained from the previous generation with the only difference being the drop of the 4-speed automatic gearbox that was dropped from the 4.5-litre and replaced by a 5-speed instead. Outputs also remained the same. Additional, power is either sent to all four wheels or the rear wheels. It’s worth noting that this shape is still currently being produced and is branded as the Nissan Patrol Safari and rivals the likes of the Toyota Land Cruiser 70 series. You can also find good deals on the old Nissan Patrol for sale in Abu Dhabi, and its reliability hasn't changed over the years. Now entering its sixth generation, basic trim is known as XE and is fitted with adaptive bi-xenon headlights, 18-inch rims, CD/Radio Tuner and fabric covered seats. SE trim levels adds a fridge, media inputs and parking sensors on top of all the XE features. LE trim adds leather upholstery, navigation system with Arabic language integration, internal hard drive for media storage, rear camera, optional LED fog lights, rear TV screens, cooling options for both front seats, 360-degree camera, keyless start, adaptive cruise control and the list goes on. As for safety, plenty of options are on the menu; multiple airbags, ABS, Stability Control, Daytime LED running lights, tyre pressure sensor, blind spot detection mirrors and Lane Departure Assist. All version come with 8 seats as standard. However, dealerships can remove a seat from the second row for a more VIP feel. This generation also retains the rear-wheel and four-wheel drivetrains but slims down the engine choice to just one, a 5.6-litre V8 petrol motor. Mated to either a 5 or 7-speed automatic transmission those looking for extra control can opt for a 5, 6 or 7-speed manual gearbox instead (dependant on region). 320 to 420 horsepower is on offer depending on the trim level with anywhere between 520 and 590 Nm of torque. 0-100 is achieved in around 7.3 seconds and can reach a top speed of just over 200 km/h. Not bad for an eight seater. This generation also sparked a number of special editions including the regional exclusive Desert Edition, Nismo Edition and Black Special Edition. All of which have distinct characteristics that are unique compared to standard Patrol; this includes one-off coats of paint, special rims, upgraded engines and added protection to the undertray. They are all fairly new editions, but if you’re lucky you can find a used Nissan Patrol Desert Edition in Abu Dhabi in mint condition. In 2017 trim, the V6 motor was introduced for SE trim levels. There are no visible cosmetic changes to any other trims expect for SE trims no longer bare the V8 badge on either side of the vehicle. Interior options remain identical across the board with the exception of SE Platinum models which are no longer equipped with cooled seats. Now that you’ve been filled in on the Toyota Land Cruiser’s biggest rivals check out new and used Nissan Patrol for sale in Dubai and Nissan Patrol in Sharjah.